Welcome to our 23rd episode in our newer podcast series where we cover everything related to investing in tax-delinquent real estate. In other words, we focus on properties where the owners have not paid the property taxes. As a husband and wife investing team, we’ve done nearly 3,500 deals – in land and houses – with little competition and big profits. And we want to share what we know with you. In today’s episode, we’re talking about contracts – how to structure your purchase and your selling contracts. We’ll get to the core of the contract pieces and what you really need in your contracts to do deals. Jack: Hello everyone. This is Jack Bosch. Jack: Husband and wife team here with the Forever Cash Real Estate Podcast. We’re excited to have you on board today again. And today Michelle, what are we going to talk about? Michelle: We want to talk about contracts, basically how to structure your purchase and your sales and basically anything contract related. Jack: All right. Let’s dive into the contract. It’s usually a boring subject. We are going to try to make that exciting for you guys here. Michelle: Actually, quick and easy too. Jack: Quick and easy too. 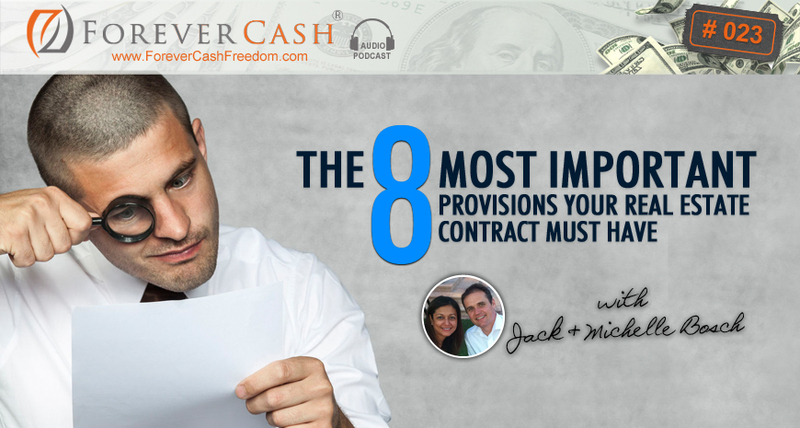 It’s going to be a shorter podcast, because we’re really going to dive just into the core of the contract pieces and what you really need to make sure when you deal with contracts. Michelle: So we won’t bore you with all the details. Jack: Exactly. We won’t bore you with too many details. We’ll of course have some details for those of you who say like, “No! I want details.” We’re going to give you some details. Okay, so with that, let’s get started. As always, we have started in the tax delinquent real estate world and winning with properties where the owners haven’t paid property takes. And, after struggling with that for a while, after going to tax deed auctions where there are lots of people after going to tax lien auctions and buying liens that quickly two weeks later were redeemed and we made like $2,050 in interest, we realized that the fastest and best way to get a hold of tax delinquent properties is by not attending the auction, but by instead going around the auction, contacting the owners directly and buying these properties that they no longer want, that they owe property taxes on and they have perhaps only a few months to go before the auction or perhaps a year to go before the auction, and buy those properties from them for pennies on the dollar. So, our Forever Cash Real Estate Investing Podcast is at its core about tax delinquent real estate investing. However, of course, we are also interviewing other people in the industry. We’re interviewing other business leaders. It’s about business growth. It’s about leadership. It’s about taking charge of your financial future. Jack: All right. So with that, first, before we get started in the contracts, we want to give you a free course that we put together about all things tax delinquent real estate investing. That course you can get at ForeverCash.com/Freedom. All right? Again, ForeverCash.com/Freedom. And also, we have podcast notes of course. We have notes. We have downloadable things. We have the transcripts. We have all the links that we’re going to mention. If we mention any additional links here, they’re available at Forevercash.com/Podcast. So you find everything at ForeverCash.com. In this case, /Freedom is the course, /Podcast is where you find the podcast downloadables – the minutes, the notes, and the links to everything we just talked about. Jack: Okay. So with that, Michelle, let’s get started. Jack: And let me jump into what it means for a contract to be assignable. Jack: Assignable means that you can take that contract and sell it to somebody else or give it to somebody else, and have somebody else take your place in the contract. So, if that contract says “Jim Smith is selling to you” and your name is perhaps Mike… I don’t know, Miller. So Jim Smith is selling to Mike Miller, and then let’s say you’re Mike Miller. And so, Jim Smith is selling to Mike Miller a piece of real estate and you put in there as the buyer… It says the buyer is Mike Miller and or assignee. If you put just those extra three words in there, “and/or assignee,” that allows you to now take that contract and give it if you want to me or sell it to me. If let’s say we’re doing an assignment agreement and I will then take over that contract, now I go to Mr… What did I say the name was? I already forgot, but whoever the name of the seller was, I can go to the seller. I probably need a little bit more coffee here. But, I can go to the seller and say, “Hey Mr. Seller, you’re no longer dealing with Mike Miller. You’re actually dealing with Jack Bosch now.” And, the seller is going to be fine with it because you just showed him a copy of the contract that says assignee and the other person assigned it over to you. As a matter of fact, most sellers really don’t care. Jack: They don’t care because all they want is to sell the property, and they signed the agreement knowing that it can be assigned to somebody else. Michelle: Another characteristic that I want to mention in your purchase transaction, how your contract needs to be is you want that contract to be very simple. Jack: Right. That’s a good piece. Michelle: In our opinion, we don’t want the purchase… basically contract to be this 17 pages long with all kinds of like detail and minutia of stuff because this only means that your seller is confused and has one more reason not to sell the property to you because they don’t understand what in the world this 17-page document says. So we usually like very simple contracts, about one page in length, and they contain just a few bullets. Jack: Right. So let me put a little framework around that for just 30 seconds. When you’re dealing… I want to make sure you really understand under what scenarios what Michelle just said is true. And Michelle, if you’re a real estate agent and dealing with another real estate agent, in a normal transaction, you want that page, that document to read 10 pages legal size and fine print and so on, because you are using like the state, approved, Realtor, contract, and so on. And, the main case here is the seller doesn’t have to understand that contract by himself. He has a realtor sitting next to him that explains that contract to him and what it all means. However, when you are an investor like us, a tax delinquent real estate investor, if you go around the auction, you go directly to a landowner, to a homeowner and you wanting to buy that property from that person, that person might be sitting on the other side of the United States, away from you. The person might be sitting nowhere close to the property. So, let’s say the property is in Florida. You are in Arizona and the seller is in New York. So when you’re sending that offer to the seller by mail, the seller sits alone on his kitchen table perhaps with his spouse. They sit there and they’re basically trying to make sense of that document. And, that’s how you deal as an investor. The majority of our deals happen that way that the seller is somewhere out of town. You are in another town. The property is yet somewhere else. And in that scenario, you just cannot use a large contract. Because what you do is if you send them a 10-page contract, they’re going to give up after three pages, throw it in the garbage and say, “Ah, I’m just going to let this property continue to go down the tax sale route and let it go to foreclosure or to the auction.” But, if you send them a one-page contract, then they’re going to look at that thing. It just has a few bullets. It has enough points in it to be a legal contract. Meaning, it has a date on it. It has a seller. It has a buyer. And, these are the six or seven different criteria in the contract. Michelle: It has a subject property. Michelle: How is closing going to happen. Jack: …How is closing going to happen. Michelle: And what the cost and how you’re going to basically split those costs. Jack: Exactly. It’s going to be… Who pays for what in terms of back taxes and closing costs, and it has the signatures on it. Michelle: And also, for how long that offer is open. Jack: Yes. And, it also states for how long the offer is still open. Now, all of these eight things that we just mentioned, only six of them are legally required for it to be a legal contract, but you put just eight pieces of information on a one-page contract. Plus, you add one extra comment that says that you as a buyer are allowed to back out of the contract anytime for any reason. Jack: And with that, you’re protected and you can always back out of the contract. You don’t need any kind of like… What is it like? Financing contingencies, inspection contingencies, mold contingencies… You name it. All those different contingencies that bring up, that make up like eight out of these 12 pages of a regular realtor contract, you don’t need them. With a simple line in there that says you can back out anytime for any reason, you can literary skip all of those things and have a contract that will hold up in court if the seller wants to back out. We don’t even know how to enforce it, but just the other day we had a live event, and at the live event, one of our students came up to me and said, “Hey, by the way, your contract holds up in court,” because they actually had a deal where the seller wanted to back out, and they actually had to sue the seller for specific performance as it’s called, to perform under the obligations of the contract. And, the court looked at the contract, a one-page contract and held it up so the seller had to sell to them. Jack: So bottom line is it’s a very small contract and that’s the frame work around it. If you have representation on both sides, if it is a deal where the seller is a realtor or the buyer is a realtor, then the 10-page contract is okay, because the realtors are trained to walk their clients through that document. Jack: But in most investment deals, you’re not dealing with that representation. Therefore, it needs to be simple. Michelle: Yeah, it’s pretty much two principles in a transaction: getting together and agreeing on certain things and also agreeing on how they will disagree if at some point they have to disagree. That’s pretty much it and that’s what it should contain. Jack: That’s right. It’s as simple as that. Also, one quick aspect on that is, think about the position of the seller. We are not… You as an investor, you’re not buying real estate. Well, you’re buying. Of course, at the end of the day, you’re buying real estate. But, what you’re really going after is urgency, right? You are buying urgency, so you’re buying from somebody who is really motivated and who needs to get out of that property, and what they don’t have is time to go look at this thing for three hours and try figure out what it means. They want to see it. They want to see the price. They want to read through it. They want to understand it, and they want to sign it. Michelle: And so, this information that we’re sharing is again, as we mentioned in prior podcasts, it is information that we’re sharing based on our experience. We are not attorneys. Michelle: But, if you need to have a contract that has been carefully drafted with all the ins and outs and details by your attorney of choice, by all means, please go for that. What we’re sharing is based on our experience. Michelle: This is pretty much what works and works really well out there. Jack: Absolutely. This is not a legal class on how to create a contract. We’re not qualified for that. But, we have done over 3,300 deals using one-page contracts. So from our experience, it works because it deals with the psychology of the seller. Jack: And that’s really something you want to keep in mind. Now, when we turn around and we sell the property, how does our contract look then, Michelle? Michelle: It is quite lengthy. Jack: That is a completely different contract there. Jack: Exactly. Because now, we want to make sure that we are protected, that we have all the dotted the i’s and the t’s crossed, and that we put some rules around how the buyer or what the buyer can actually do and how we’re allowed to foreclose on the buyer if the buyer doesn’t fulfill his obligations, particularly if we do seller financing which is one of our favorite ways of selling real estate, where we take a note back, where we basically do seller carryback and where the buyers just pay us a down payment and make monthly payments. So Michelle, you probably want to talk a little bit about that. Michelle: Yeah. And basically, what we use there is a… And this is for land. When we’re selling homes, it’s also just as lengthy if we were going to do seller financing. And actually, in homes, we would use a note with a deed of trust. And if we are doing land, we would do a contract for deed or land contract. That’s what we use. And for that, for those two contracts, we have gone through the extent of basically hiring an attorney and having that person draft that document, and even there, with time and experience, you’ll find that you will run into certain situations and as time goes by, you’ll continue to add to that contract clauses to it that protect you when you’re selling the property. Michelle: Note with a deed of trust. Jack: Note with a deed of trust. And, the other one is? Jack: For that many payments. Michelle: For that many payments at this interest rate and with these fees and so on and so forth, and this is what’s going to happen when that person doesn’t make their payments, where do they need to make their payments and so on. So, there’s quite a bit of detail of the things that they can do or cannot do to the property and so on and so forth. Jack: Because in the contract for deed, we’re actually not giving them a deed to the property until the very end. Michelle: Yeah. Once basically, in this contract, we’re agreeing that once everything is paid in full, they will be issued a deed that gives them full ownership to the property. And then, you might be saying and asking yourself, “Well, does that mean that during the time in which they’re making payments, they’re not the owners?” Yes they are the owners. They have an interest in the property. And, you can actually make that public record just by simply recording that land contract in the county recorder in which the property is located. Jack: But technically, what it is, is over time, they’re adding an equitable interest in the property. Jack: But, they still don’t have a deed to the property. And what it also means is… So basically, the deed of trust, the land contract, the contract for deed… These all three terms mean the same thing. These documents are great documents to use, but the main part about them is they’re really kind of like a hybrid between a document that transfers ownership and a note. In the first document, the deed of trust, you gave them a deed and then they gave you back a deed of trust and a note, so there’s an interchange of multiple documents happening here. And, they become the owner, and then they give you a deed that says, “Hey, if I don’t pay this note, you have the right to foreclose on me.” Well, in the land contract or the contract for deed, it’s all rolled into one document. It’s a document that says, “I’m selling you this property for this amount with this down payment, these monthly payments in these terms, and you get to stay in the property. You get to use it as if you own it almost, but there are a few restrictions.” For example, if it’s land, you cannot cut trees down and things like that. “And once you’ve paid it off, we give you a deed. But if you don’t pay it off, then here’s how we can foreclose on it.” So it’s all rolled into one document which is really, really cool. It makes life much simpler. You don’t have to exchange deeds and deeds of trust and notes and things like that. You just sign both sides of one document and everyone is set and done. Plus, in some cases, in some states like Arizona, like Nevada and a couple of other states, actually foreclosing on a land contract is also much, much easier than it is on a deed of trust and a note, and in some cases, you can foreclose on them after 30 days. If they miss one payment, you can already foreclose. Now having said that, this is not the way we do business. We don’t want our buyers to foreclose. We don’t want to foreclose on our buyers, but it’s good to know that you can if you have to. If somebody goes AWOL on you and completely disappears and doesn’t make any more payments anymore or you can’t get a hold of them anymore, it’s good to know that you don’t have to jump through a lot of hoops to be able to foreclose on a property. Jack:…Nevada where it’s very simple, and there’s a couple of other states that’s very simple also. Again for those details, you want to go… If you’re not in Arizona or Nevada, you want to go to your local attorney, to your local CPA, to your real estate department and look if that agreement is legal. As far as we know, this contract for deed is legal in every state. There might be some issues in Texas for it, so you might want to look into that if you are in Texas. Jack: All right. So what else do we have to cover about contracts? Really, we didn’t want to go into like… We were not attorneys, not CPAs. So, we just want to make the distinction that when you buy, you want to use a very, very simple contract. When you sell, you want to make sure that you can have the proper rights to foreclose on the property, the proper rights to enforce your rights and so on and so forth. So, it’s a different document that you use when you buy than when you sell. Jack: It’s just that it’s very simple, very cut to the point. Because again, whether you get a contract from somebody, whether you get this commitment to sell to you at a certain price within a certain time period, or whether you get an option which is they give you the right to buy at a certain price within a certain time period but not the obligation, the differences are small but important. But yet again, you’re dealing with the same psychology of a buyer, and when you deal with options, you want to take that into consideration. The beautiful thing about options is… We’ll talk about it in another podcast. With an option, you don’t have to actually commit to buying it in the first place. You just get the right to buy it, and then you can go around market it. And when you find a buyer, you exercise your option and move on from there. Michelle: And don’t worry about if you’ve heard of options in the context of stock. It has the same underlying principles where there’s an asset and basically it’s a derivative, but don’t worry. We will demystify. It’s so, so simple to use options and what we call real options, real world, other than the stock market. Jack: We’ll cover that in the next few weeks. So with that, pretty much, that sums it up. We went to the eight pieces of information that should be in every contract when you buy it. We talked a little bit about our selling contract, particularly when selling it with seller financing. Obviously when you sell it for cash, you can potentially use the same contract that you buy as when you sell. You just want to remove that option that the buyer can back out any time for any reason. But when you sell for seller financing, then it’s where all these provisions come in that you need to make sure you are protected, that when the buyer stops making any payments that you can foreclose as fast and as quickly as possible. All right. So again, in our show notes, we have the links over to the place where you can get your free tax delinquent investment course. We also have the show notes found under ForeverCash.com/Podcast. And last but not least, don’t forget to actually give us some feedback on our podcast. If you are on iTunes, you can do it right there. I believe you can also do it on your iPhone. If you’re not on iPhone, again you can go to iTunes.com and look for Forever Cash Real Estate Podcast. You’ll find us right there. Or, download it or go to the iTunes app. Of course, the more stars, the better. Michelle: Yay! We want five stars. Jack: Or as they say, if you have five stars, please spread the word. If you think we’re one star, keep it to yourself, okay? But, I hope you enjoyed this. So, we have many more podcasts coming up. One of them is going to be about options. So with that, we say thank you very much. Have a wonderful day. Michelle: Thank you. And, talk to you guys soon.